1,100 Jakarta Environment (LH) Dept. 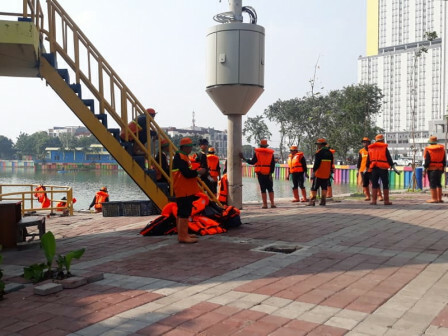 personnel were deployed to clean up west side of Sunter Lake, Sunter Jaya, Tanjung Priok, North Jakarta, Friday (7/20).
" It will be hard if cleaning is only done by our personnel. But if we do it together with residents then this work can be lighter"
North Jakarta Mayor, Syamsudin Lologau appreciates this activity since it makes that area which is next to Wisma Atlet becomes cleaner. He hopes this activity can be done continuously thus Sunter Lake area is totally clean from trash when Asian Games event is held. "It is a part of Wisma Atlet area. So we need to take care of its appearance, cleanliness, and others," he stated. Jakarta LH Dept. Deputy Head, Ali Maulana Hakim explained, this cleaning is done as a part of preparation in welcoming Asian Games that will be held less than a month from now. Beside Sunter Lake, cleaning is also done in other locations. "Total 2,000 personnel were deployed to clean several locations today. While 1,100 of total personnel mostly from Water Agency were also deployed to clean this area," he informed. Beside conducting Gerebek Sampah, his side also deploys personnel in venues and Wisma Atlet routinely. His side continues to intensify its monitoring and socialization thus residents want to participate in maintaining cleanliness. "It will be hard if cleaning is only done by our personnel. But if we do it together with residents then this work can be lighter," he affirmed.